Mushrooms! Every since I was a kid I’ve loved them, even out of the can. Maybe it was those browned butter ads on TV, but they looked and smelled so delicious and were kind of exotic! Like fairies used them as shelter. And then we had magic mushrooms, mushroom clouds, and all the mushroom jokes “Why did the fungi leave the party? There wasn’t mush room.” And I have more of them but I will spare you. They have a chewy meaty texture that is very satisfying too. The best mushrooms in my humble opinion are dried. I buy dried shitakes as often as I can, usually in Asian markets. One of these days I want a really good tour of an Asian market to figure out what goodies I am missing…. 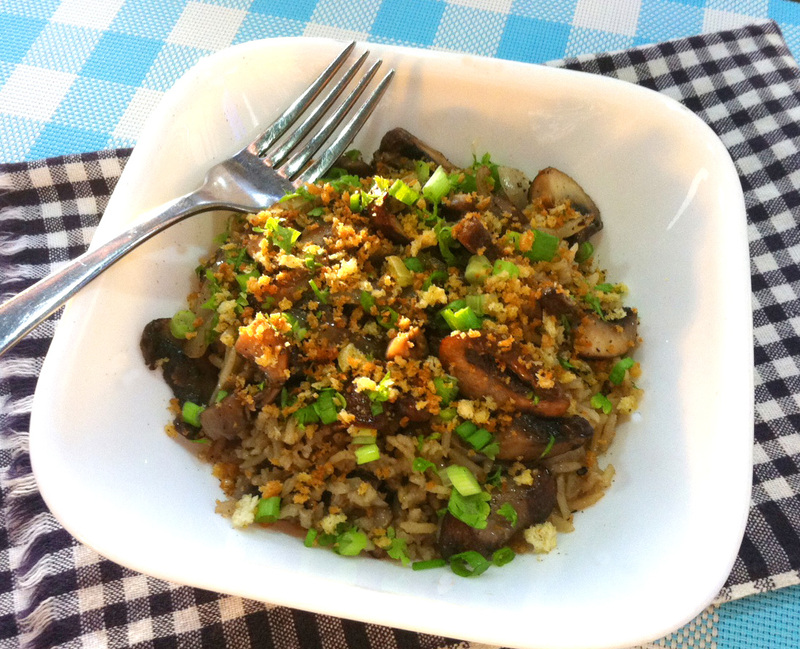 The dried mushrooms make a gorgeous flavorful broth when soaked in boiling water to soften. That really packs an umami punch. 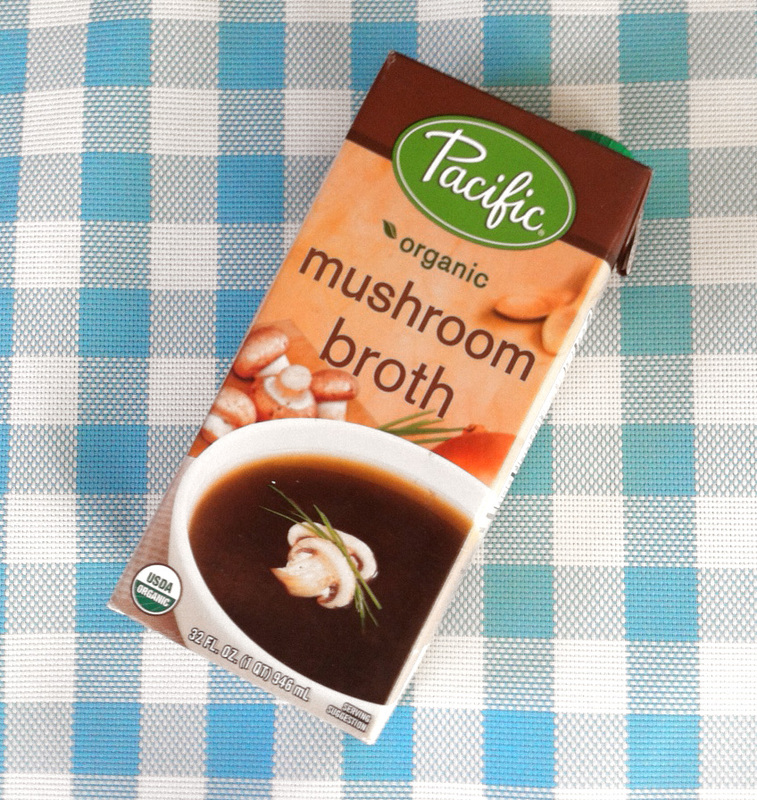 But the backup is to buy pre-made mushroom broth. Good luck! So far the only place I have found it is cartons made by Pacific Natural Foods and sold in Whole Foods. So this recipe indulges my love of mushrooms with an excessive amount of them (8 ounces is quite a few, maybe 10 mushrooms) mixed in with a modest portion of Trader Joe’s Brown Basmati Rice. Once the dish is made, I topped it with toasted Panko crumbs, Truffle Salt from Cost Plus World Market, sliced green onions and parsley. This whole dish is made in one skillet, you can do it outside on your grill. This would be great accompanied by grilled or sautéed vegetables like snap peas, green beans, yellow patty pan squashes, zucchini, or greens. In a skillet, make Panko crumbs first. Over medium-high flame, add 2 tablespoons of olive oil and half the minced garlic. Swirl around for about 30 seconds (the aroma will come up) then add Panko crumbs and keep them moving until they are toasted to a golden brown. Set aside and wipe out the pot or skillet with a paper towel to remove any leftover crumbs. Melt butter in the same skillet over medium burner. When hot, add mushrooms, onions, and garlic. Cook over medium heat until most of their liquid has evaporated. Add rice and saute for a minute or two until lightly browned or is too dry to manage. Add broth (2 cups for 1 cup of white rice, 2.5 cups with 1 cup of quick-cooking brown rice like Trader Joe’s brown Basmati rice), bring back to a boil, turn down to the lowest burner setting and cover. After about 15 minutes remove cover and check for doneness. Stir lightly and put in bowl, topped with scallions, parsley more cracked pepper, and Panko garlic crumbs to taste.